Los Angeles native, Rachel Shultz was born into a family of artists and at a very young age saw her parents happy at work making art a way of life. The house was always buzzing with creativity. Many rooms in the house were devoted to the process of making art and the doors to those rooms were never closed. It was an environment ripe to inspire her young mind. In 1994 she studied Art and Art History at Santa Monica Jr. College and in her last year was awarded the mentorship scholarship to the San Francisco Art Institute. She studied there in 1996 and used her time there to pursue her interest in sculpture, mixed media and installation art before finding painting to be her desired medium. While still in school, inspired by her fathers work in the medium of reverse painting, she began to explore this technique in her own work. After traveling to Brazil in 2005 and being inspired by Brazilian music and dance she started using a dynamic, rhythmical approach to reverse painting. She began to throw and pour paint onto the plexiglas. Her reverse layering process allowed her to intuitively approach themes of nature while playing with the idea of energy and light as its own language and color as its own content. She examines how color can be the primary element in conveying deep emotional states. I use the paint’s translucency to suggest a layered depth. By using a variation in saturation, tone and hue I hope to evoke an elusive yet palpable realm of space. My paintings are as much about light as they are about anything else. I paint in reverse on Plexiglas because this helps to achieve the luminosity I’m after in moving toward “color as content”. Much of my work depicts nature. I have always felt drawn to nature and its mysterious and beautiful forms. These forms are a starting point to explore their potential symbolic meaning. My forest series allows me to contemplate my feelings of connection to the earth. I think of a forest as a place where life is constantly unfolding in a limitless expression of nature’s abundance and innate cooperation. I also see forest as a metaphor for the human imagination…that place within ourselves that is always seeking freedom and growth. Light On the Earth is a new series of paintings that was born out of my Abstract Forest Theme. In these new paintings, I continue to explore the beauty of nature and play with the idea of light as its own language and color as its own content. In Light on the Earth, I begin to take the subject of Forest even further into mystical and abstract realms. 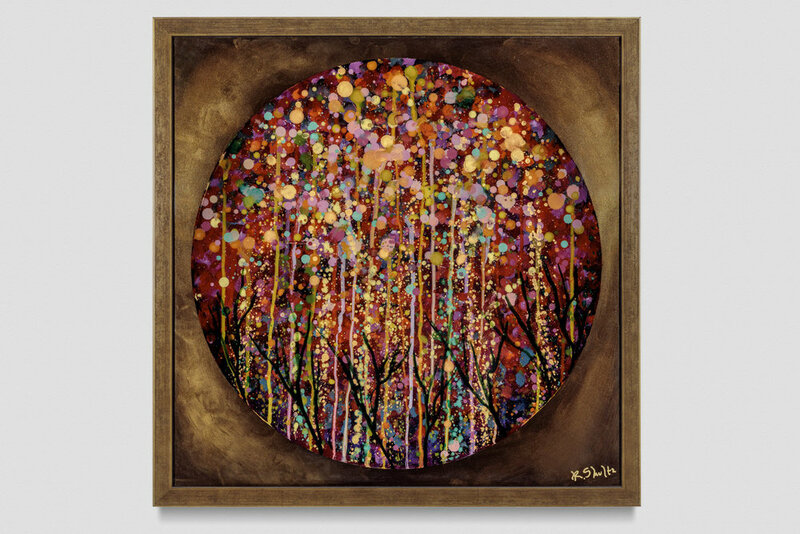 In my Lunar Forest paintings, the Moon takes center stage and hangs in an imagined Forest at night. A forest filled with glowing light that falls on barely seen trees. The size of the moon in relation to the surrounding space asserts the moons power and presence, and tries to convey the beautifully mysterious power the moon has over our daily lives. In “Speaking to the Light” and “Light on the Earth” I deconstruct the process used to create these richly layered and patterned forests. I then combine several techniques to create geometrical patterns that are playful, filled with rhythm and movement and meant to delight the eye. Some parts of these paintings suggest an abstract realm of space and light outside the forest. The viewer can come to their own conclusions about the relationship between these two spaces and how these spaces intersect. Some of the colorful line work in “Speaking to the Light “and “Ascension” can be seen as ladders where each rung is a visual clue moving the viewers eye through the painting. On a more psychological level these ladders can be seen as symbols for growth or expansion, a mode of traveling through different dimensions, or possibly as intersections of Heaven and Earth or the spiritual and the material.